ISS Expedition 11 commander Sergei Krikalev manually docked the Progress 18 spacecraft at the space station using a remote control system and navigation data and video from vehicle's onboard instruments. It took thedeft hands of space station commander Sergei Krikalev to dock a new cargo shipat the International Space Station (ISS) Saturday after the unmanned spacecraft'sautopilot could not complete the job. A problemwith a Russian ground station prevented flight controllers from uploading finaldocking commands to the unmanned Progress 18 cargo ship, prompting Krikalev - aveteran cosmonaut and commander of ISS Expedition 11 - to ease the spacecraftinto a docking port via remote control, NASA officials said. The manualdocking occurred at 8:42 p.m. EDT (0042 June 19 GMT) - about two minutesearlier than scheduled - as the ISS flew over Eastern Asia. 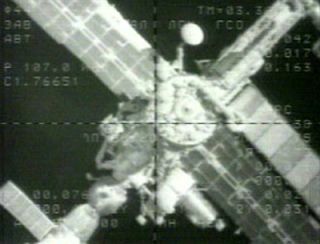 Krikalev used theRussian-built Telerobotically Operated RendezvousUnit (TORU) manual docking system inside the space station's Zvezdamodule to guide Progress 18 into port. "Excellent,"Krikalev told Russian ISS flight controllers as Progress 18 dockedsuccessfully. "It was very helpful to have all the TORU training, please say 'Thankyou' to my trainer for me." Krikalevand Expedition 11 flight engineer John Phillips were expected to crack openProgress 18's hatch Saturday evening and beginning the multi-day unloading processon Sunday. Progress 18'ssuccessful docking ended a two day's of orbital catch-up for the vehicle, whichlaunchedatop a Russian-built Soyuz rocket on June 16 from Baikonur Cosmodrome in Kazakhstan. Thespacecraft is currently docked at the aft end of the station's Russian Zvezdaservice module, occupying the same port its predecessor - Progress 17 - usedduring its time at the ISS. Krikalev and Phillips discardedProgress 17 on June 15 after filling it full of trash, waste and other unneededitems. With itssuccessful docking, Progress 18 brings with 4,662 pounds (2,114 kilograms) ofcargo to the Expedition 11 crew. About 3,100 pounds (1,406 kilograms) of thosesupplies are dry cargo, including food, equipment and experiment hardware. ButProgress 18 also delivered vital replacement parts for the space station'sprimary source of oxygen, the Elektron generator, which failed in May. TheElektron device uses the process of electrolysis to separate water into breathableoxygen and waste hydrogen, which is then dumped overboard. The generator'sfailure forced Krikalev and Phillips to consume first the oxygen suppliesaboard the Progress 17 spacecraft, then dip into solid oxygen-generatingcandles to maintain their breathable atmosphere. Progress 18contains about 40 additional oxygen-generating candles, as well as 242 pounds (109kilograms) of breathable oxygen and 926 pounds (420 kilograms) of water, NASAofficials said. The spacecraft also delivereda new camera to the ISS that the Expedition 11 crew will use to photograph thethermal protection tiles of much-anticipated space shuttle Discovery during apre-docking maneuver. Discovery is slated to launchno earlier than July 13 and will be the next spacecraft to visit the ISS if itmakes its launch window, which closes on July 31. The space shuttle's STS-114mission will mark NASA's first orbiter flight since the Columbia disaster in2003, which led to the loss of both the Columbia shuttle and itsseven-astronaut crew during reentry. Since then, only Russia's unmanned Progress and manned Soyuz spacecraft have been able to ferry new crewsand supplies to and from the space station. Discovery will not only resupplythe ISS during its much-anticipated flight. It will also test a series of newprocesses and equipment to increase shuttle flight safety. Krikalev and Phillips areexpecting two space shuttles to dock with the ISS during their six-monthmission, which began in mid-April when they first boarded the orbitallaboratory. In addition to Discovery's July spaceflight, the crew alsoanticipates the arrival of the Atlantis orbiter and its STS-121 crew in earlySeptember. The next cargo ship due atthe space station, Progress 19, is slated to launch on Aug. 24, 2005.